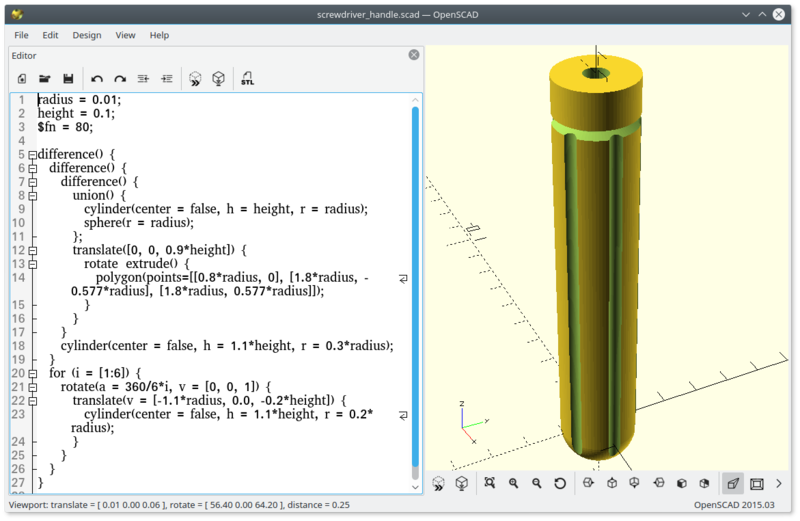 There are several open source tools for preparing 2D and 3D finite element meshes like Salome, FreeCAD, Gmsh, Netgen, etc. Most of them are GUI based geometrical modeling and meshing environments/tools but they also usually allow using their libraries in user scripts. Some of the above mentioned tools are handy for solid modeling, some of them are great for meshing. 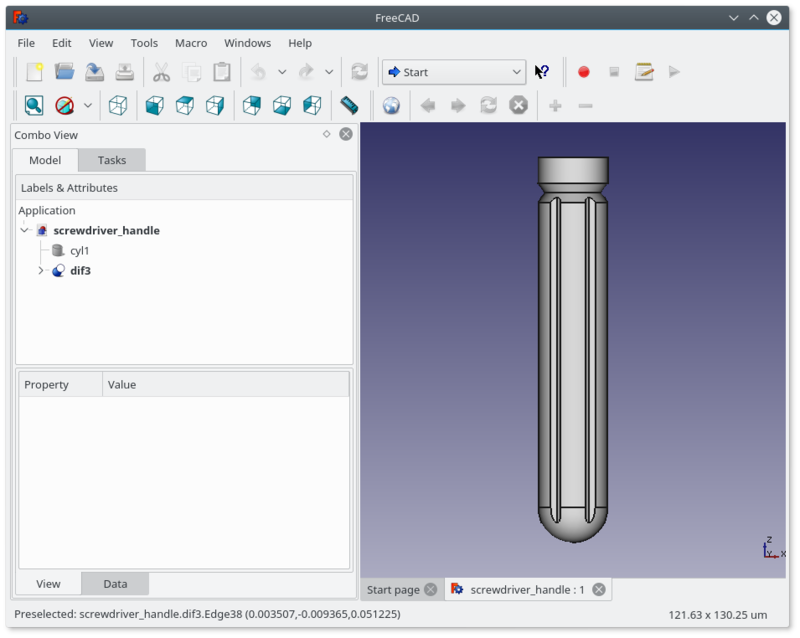 This tutorial shows how to combine solid geometry modeling functions provided by FreeCAD or OpenSCAD with meshing functions of Gmsh. The collaboration of modeling, meshing and conversion tools and the workflow are illustrated in the following scheme. Functionalities of FreeCAD are accessible to Python and can be used to define geometrical models in simple Python scripts. There is a tutorial related to Python scripting in FreeCAD. All new objects describing the geometry will be added to this document. The meshing function of MeshPart module is limited to triangular grids so it is better to use Gmsh mesh generator which can provide triangular and quadrilateral meshes in 2D or tetrahedral and hexahedral meshes in 3D. 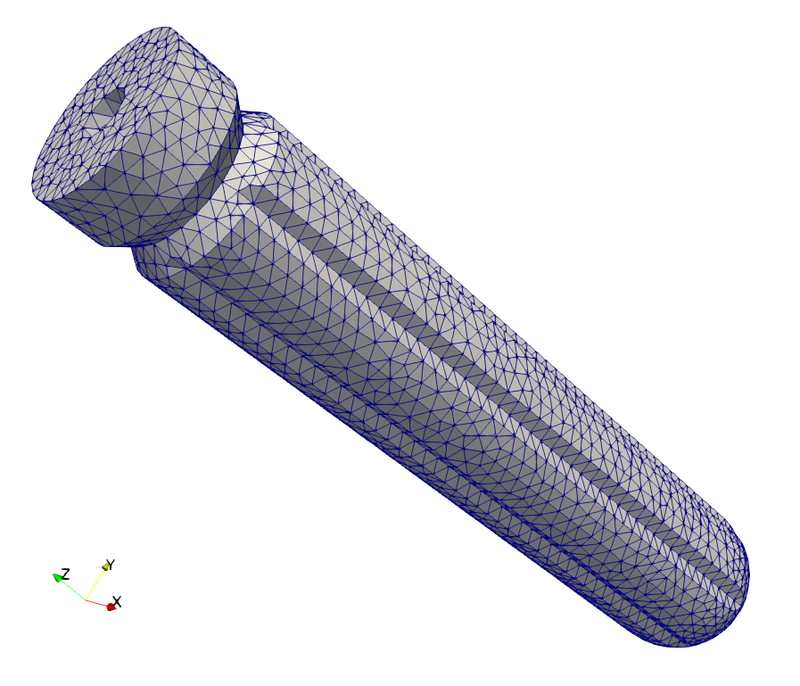 Gmsh allows to control the meshing process through a wide range of parameters. Meshing by Gmsh will be described in section Gmsh - generating finite element mesh. The example of screwdriver handle: screwdriver_handle.py. There are two simple ways how to discover Python calls of FreeCAD functions. You can enable “show script commands in python console” in Edit->Preferences->General->Macro and the Python console by selecting View->Views->Python Console and all subsequent operations will be printed in the console as the Python code. The second way is to switch on the macro recording function (Macro->Macro recording ...) which generates a Python script (FCMacro file) containing all the code related to actions in the FreeCAD graphical interface. 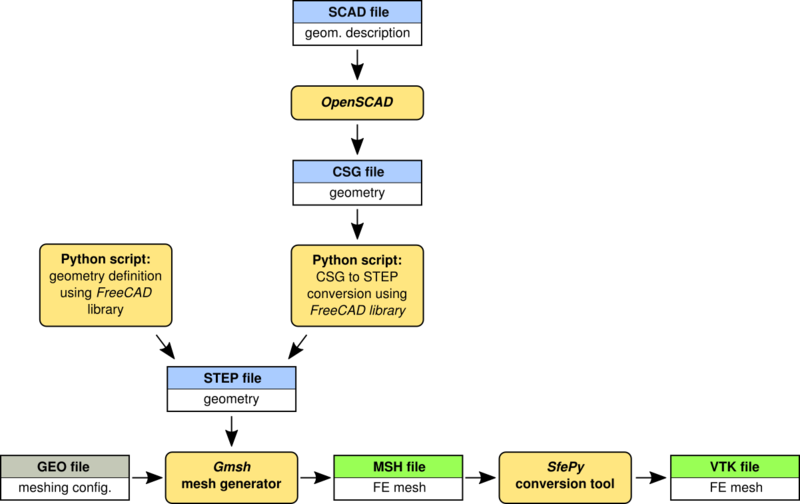 Gmsh can create finite element meshes using geometrical models imported from STEP, IGES and BRep files (has to be compiled with OpenCASCADE support). the surface elements are discarded and only the volumetric mesh is preserved. This is due to the fact that the legacy VTK does not support 2D vertices and so the VTKMeshIO reader tries to detect the planar geometry by comparing the components to zero - the --2d option of script/convert_mesh.py is not needed in this case. 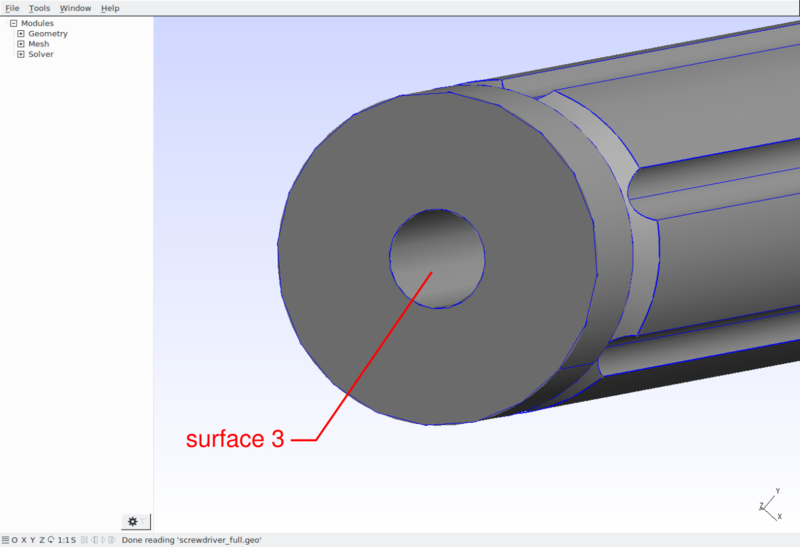 Meshing models composed of parts with different material groups is a little bit tricky task. But there are some more or less general ways of doing that. Here, the method using functions of Gmsh for periodic meshes will be shown. 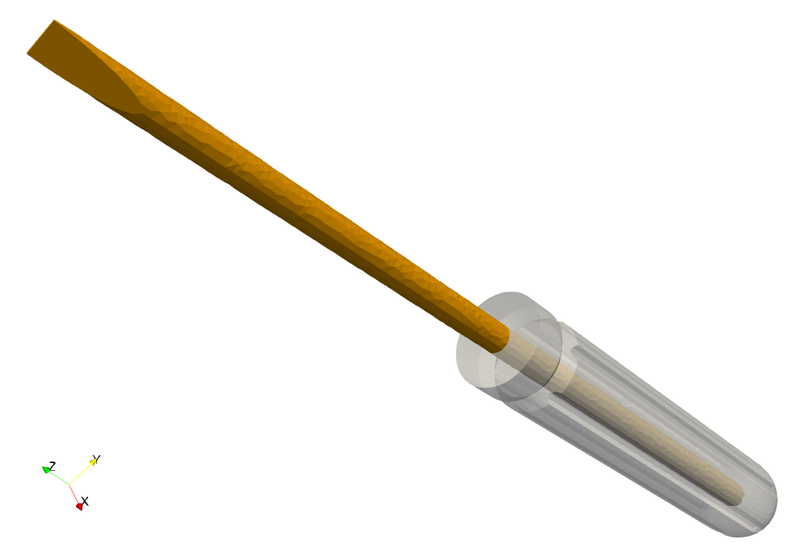 The full screwdriver example (handle + shank): screwdriver_full.py. 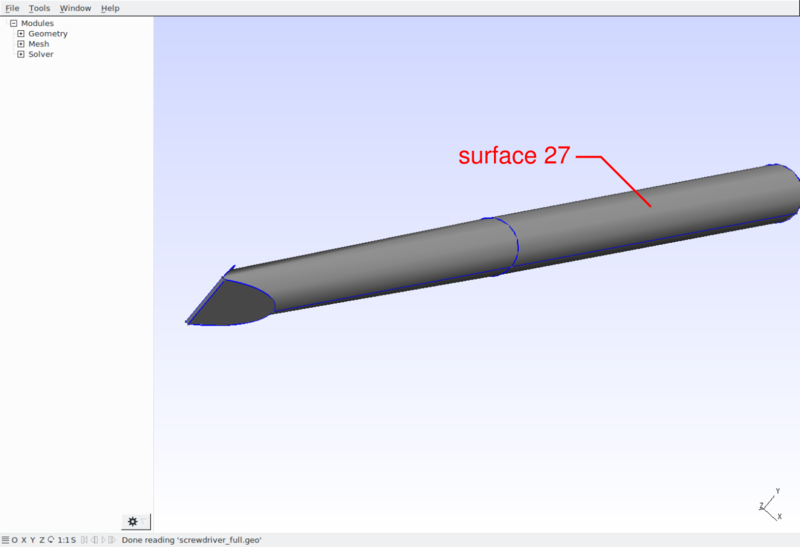 To create a coincidence mesh on the handle and shank interface, it is necessary to identify the interface surfaces and declare them to be periodic in the GEO file. The identification has to be done manually in the Gmsh graphical interface. 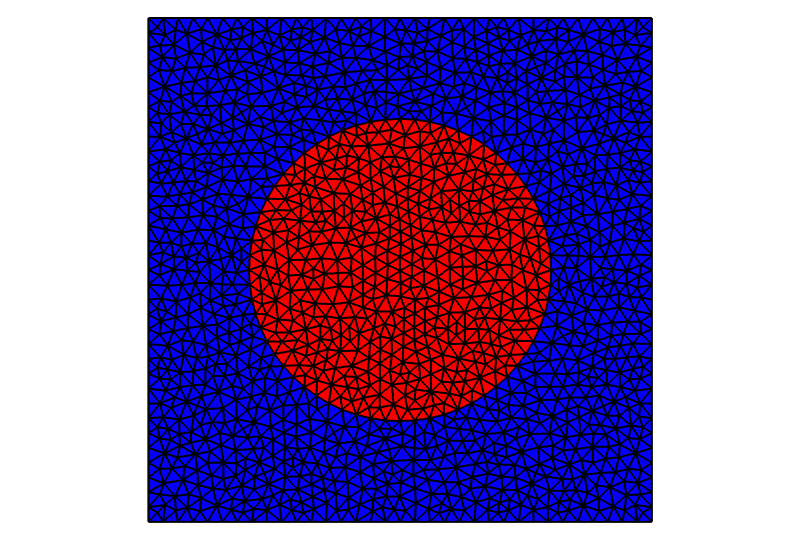 where the first pair of periodic surfaces corresponds to the common circle faces (bottom of the shank) and the second pair to the common cylindrical surfaces. See Gmsh Reference manual for details on periodic meshing. It produces screwdriver.vtk contaning the original mesh and screwdriver_matid_1.vtk , screwdriver_matid_2.vtk files containing only the cells of a given physical group and all vertices of the original mesh. Note: The numbering of objects may vary between FreeCAD, OpenSCAD and Gmsh versions.